... an open design project. Chime in with photographs, drawings, ideas, experiences, calculations, prototypes, weighings, pros, cons, what ifs, etc. Easy conventional solution: Just fly in a manner that gives a great landing without a whack; such is a separate topic and an important topic. But this present topic invites some other scenarios, and some deliberate specialized activities besides the emergency mishap handling. Meet the ground or water with a happy face without damages or with less damages. Avoid broken necks, lost knee caps, broken fingers, broken arms, etc.. How? Notice how wheels can gouge soil and act like a brake and pitch rotating cause; notice the same for basebar parts and knuckles. 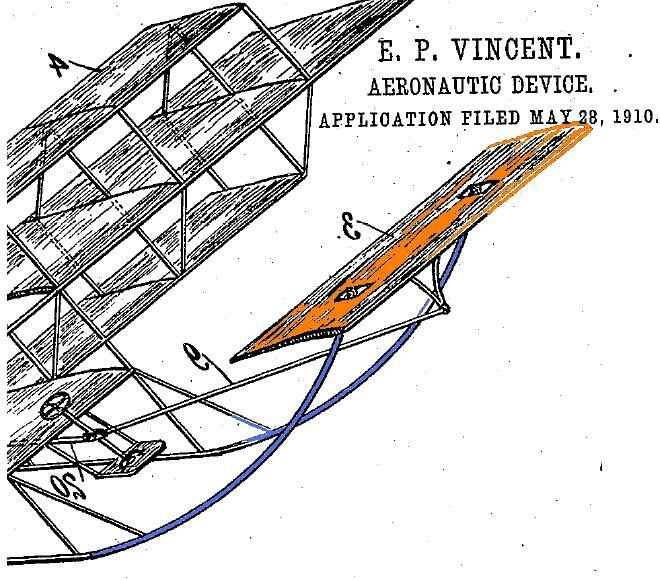 Look at the history of aviation and various ways designers responded to the landing event. Look at the history of hang gliding and see some partial solutions to the whack event. May this thread bring together these history of solutions, partial solutions, etc. A target is a set of solutions that may be explored. Ski, skids, rollers. arrestors, and more. Have fun. I will visit here from time to time to further the topic. References would be great. Links? How to safe splat? Ways and means. 1. Urban small-flight down-street landings on streets. 2. Irregular holey and rocky landing area. http://www.youtube.com/watch?v=UCSKv0sD_HA Gouging small wheels on friendly landing ground texture. Near lifetime broken neck, etc. ; near fatal. 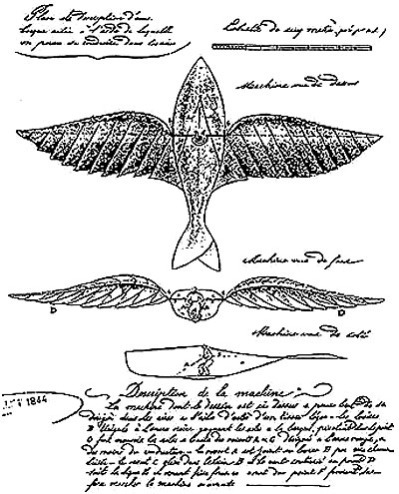 Long-tradition aviation solutions are not involved. Safe-Splat is not installed. False dependence on small wheels. Greblo methods would have avoided. Well, still, some minor TCF ski as used by early 1975 HG pioneer Tony Prentice would have done wonders in this instance. And recall the recent Jonathan D. downslope downwind landing. Sleigh: For more:Sugarloaf Mountain Sleighs - scale model to FULL size. 6. Face guard that is inset of the flow of the upper helmet surface. 13. What has been the cost in injury and fatality for not having a Whack-no-More Safe-Splat structure on hang gliders? 17. Material choices? Titanium? Fibers? Silicon? Ablation matter? 18. One or two or three runners or skis? 22. Breakage and then what? 23. Niche-activity repeatable desires? Non-consumption designs verse one-time arresting designs? 24. Explosive positioning of parts? 25. Double-purpose of some birds' necks? 26. Visibility matters? See-through materials? Put out of the way after launch; bring into place before landing? 27. Effect on training and practice sessions? 29. Does LeBris have something for the exploration? 32. Damped impact versus undamped impact? 37. 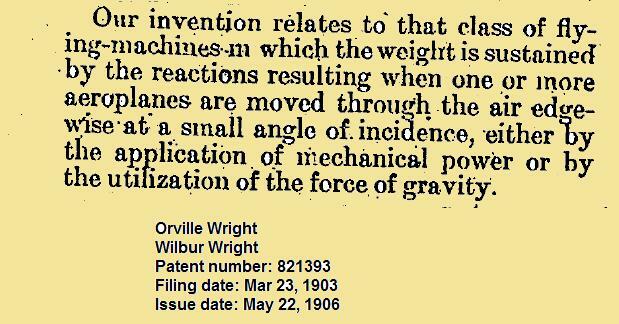 Integrate with the twin-queenpost (triangle control frame (TCF) that has been so popular in undercarriage for over 100 years) system by various means? As the "whack" progresses, the lines progressively divert forward motion into upward motion. They may also tend to bring the nose up as a consequence. I would be surprised if this hasn't been considered before because it's such an obvious idea, so you might want to check around to find (and post!) some old drawings of anything similar. P.S. Thanks for making me think a bit!! I am assuming the diagram accepts a stopped basebar while the circle with yellow and black is the pilot's body while the main hang line is with a set of graduated arresting lines going to the aft keel? Is that correct about the drawing? [ ] This is to be explored for its actualities; this can be explored first with model splats and video. Parallel with that visual study could be a mechanical vector analysis. Changing the degree of basebar stoppage and the amount of arresting-line resistance would be neat. A variable program changing the skid of the basebar at various speeds with various wing masses and pilot masses could be a masters degree project for someone. Just how much basebar skidding would change things against how much arresting ... and the still swing path of the pilot would be interesting. 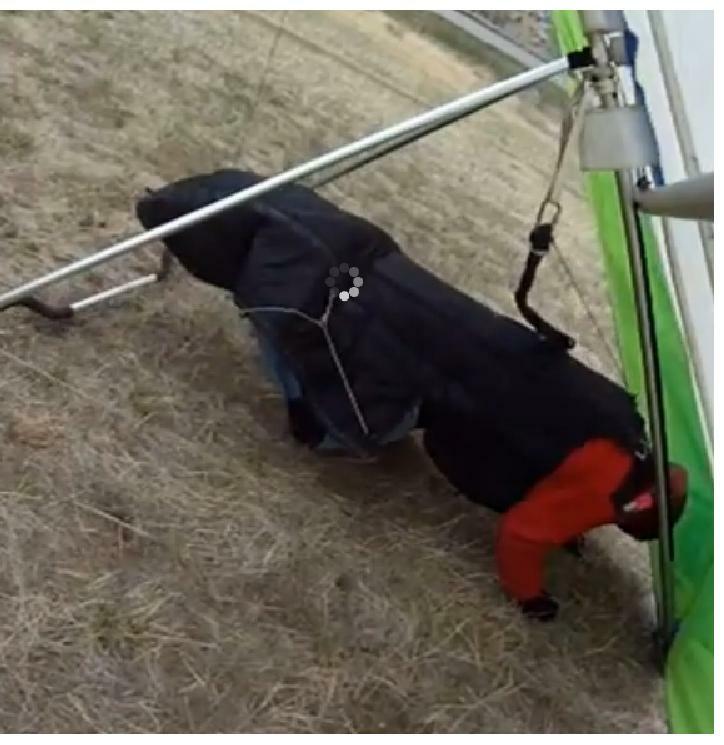 Some whacks nearly decapitate the hang glider pilot with nose whacking on the head and neck for some gliders. 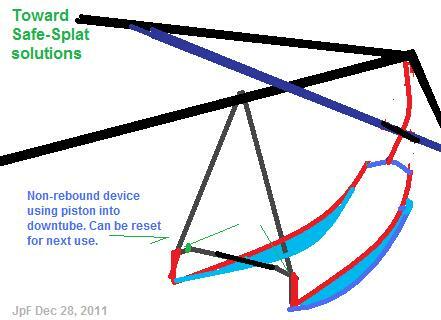 Yes, the diagram shows the pilot's motion assuming that the base bar has been completely stopped. Of course, the glider would also be rotating forward which is not shown in the drawing (or animation), so you have to superimpose an additional rotation on the drawing. wrong! Too much drag, obstruction, complexity; let me be brief, ' Air Bag' or, more taste less filling. Thanks again Joe, where would we be without you? I still have a most inspiring copy of 'Low and Slow', SeeYaLater!! 1. Your air bags do need to be in the choice mix as the project goes further. Air bags can be of various sizes and be placed in various ways. Nose? Pilot? Front lines? Airbar roller? Huge airbag wheels. Much to explore. Let's keep the airbag realm. Airbags are solutions for some Mars landing, car crashing, etc. What about having harness or flightsuit being valved to be explosive enlarged to stiffened pilot in a surround airbag upon pilot choice or event via smart program? 2. It is not clear what is in your focus when you posted: "Too much drag, obstruction, complexity; ". Please tell what you had in your focus as target for that summary discount. 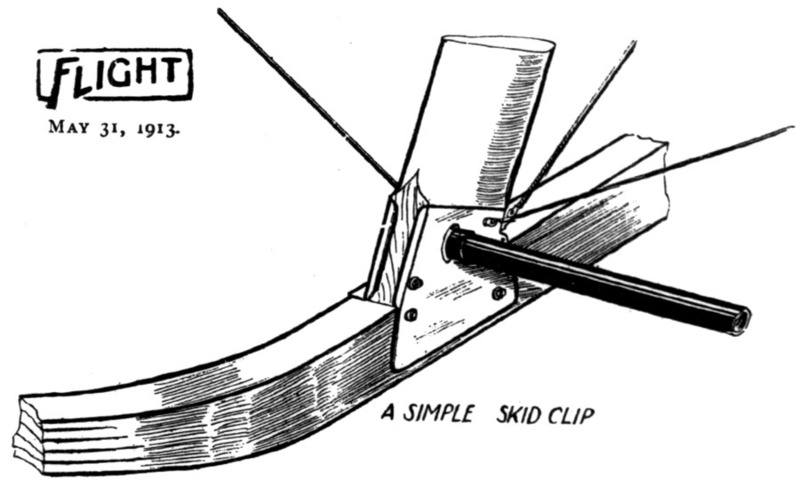 Generally, the topic is just getting started; only teasing directions are posted, except the partial stepped arresting BobK items under the assumption that the basebar catches and stops the basebar. Your "flex skids" can be with low frontal drag profile; they can even be shaped and positioned to be streamlines and even slightly lifting. Leave open for the possibility of having device moved out of sight during flight (just positioned during launch and during landing). c. Made to take on the color of the sky. d. Made to report that which is beyond the surface by the invisibility tactics that have been developed (device that reads the beyond and duplicates the seen to the top surface of the ski that the pilot sees, thus making the ski invisible to the pilot). g. Photographs of family and waypoints. Please expand: " TJM wrote: more taste less filling." I am not seeing or understanding the phrase. TIA on that. ?? Fully release from wing and trigger explosive spherical enclosing airbag for pilot roll. Mars-like lander? That is, if the emergency landing looks like this would be the way to go. Part of a solution might include non-rebound shock absorbing, as rebound is drastic and is to be avoided. One direction of solving could use the queenposts as holder of air to be used in the non-rebound shock absorbing. The ski can be below the basebar by substantial amount so that boulder and brush do not snag or catch the basebar during impact action. The rear of the ski could be with a posting that pistons into the queenposts (TCF downtubes). Then also, after som ski impact some wheeling could get exposed or not. The surface of the ski might be moving surface as conveyor belt or teflonized or with ablative material. Choices to explore. Other non-rebound tactics: bungee with piston cam catched to prevent return or rebound until after landing event; then perhaps release cam for reset for next flight. On pilot-body arresting: Limit lines from the bottom of the queenposts (downtubes of triangle control frame TCF) would perhaps be an option to the BobK stepped arrestors or in combination with such. Transformer solution? 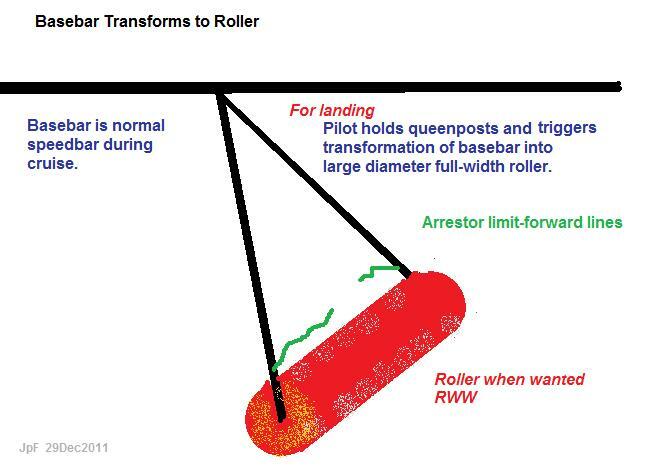 Trigger for the entire wing to become a huge roller with pilot body pulled to center. Transforming speedbar into large-diameter roller when wanted. As a diver (three meter board and six meter board. ), skater (ice type), and having been on a trampoline doing somersaults, it has been my experience that tucking into a smaller ball off of the diving board or trampoline will accelerate the somersault rotation speed. Opening up the tuck will slow the rotation speed. While spinning on the ice moving arms and free leg in closer to the rotating axis of the body will accelerate the rotation speed. In my estimation the tightening of each restraining lines will shorten the arc that the pilot is traveling and would accelerate the pilot into the keel tube. Also would a KPL keel take the load of the restraint lines? You may be right Bill. Conservation of angular momentum does increase the rotation rate as the circle gets smaller. Your figure skating analogy is an excellent example of that effect!! But there's a lot going on there, and it's not clear to me what would happen. That's why I'm curious if anyone has tried it before. As for damaging the keel from the restraint lines, I think that might be an acceptable tradeoff for many pilots if it saves them bodily damage. 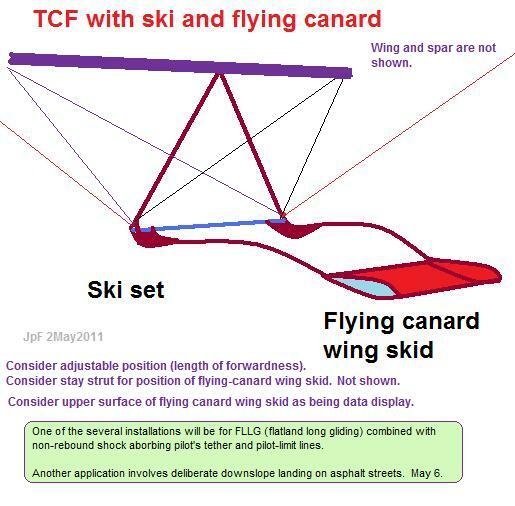 Typo on image link call is here corrected for Ski Glider Sharing the side view of its drawing. How about a more traditional solution ... intentionally landing on fairly large wheels with a tailwheel on the keel? Lots of tandem pilots do that very successfully. I think that's also what Tad has advocated. It works especially well if you're landing in a prepared field like Sylmar or Crestline or Wallaby. My tandem at Wallaby was landed on the wheels and it allows the pilot to stay prone and on the base tube throughout the entire process. Adding theTandem Traditional Tri-Wheel ( "3TW" or TTTW) option to the spectrum as proposed by BobK! (this parameter can be from very open mysterious to very sure planned). 3. Forward wheels may be floating wheels for water floating option. 4. The TTTW direction has option to be combined with other Safe-Splat options. A. Single flight with high-certainty of landing-zone texture/design. B. Mysterious landing-zone XC allowing soil or water landings, upslope-downwind, downslope-downwind. D. Hidden when not wanted, but deployable when wanted at launch or landing sector. Out of sight and out of drag-making when not wanted; but when wanted, deploy into position. 6. Groomed launch and landing areas versus challenge areas. 7. Mass cost tracking over solution set. Safe-Splat and the braking realm? In some Safe-Splat scenarios there may be specific wishes for focused braking means. 5. Brakes on wheels or rollers. 6. Air brakes. Drogue? Super transformation of wing? Drawn curtain? 7. Arrestors pre-set in LZ. 8. 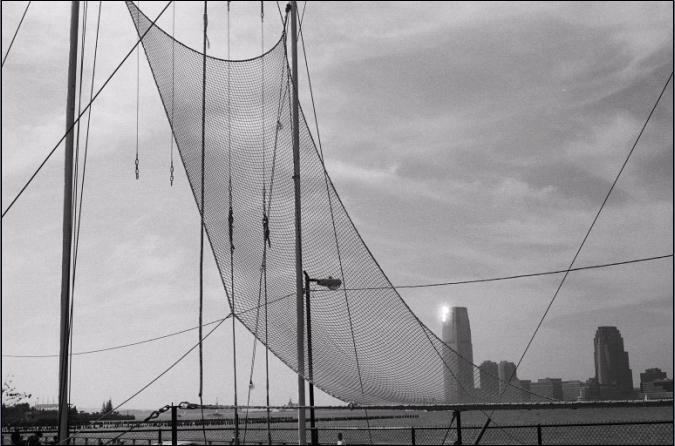 Deliberate landing into air-held nets. "landing nets". Have kite system hold up a large catchy net. Snag it. Airborne Safe-Splat ? 11. Cushion field (foam, boxes, leaf piles, giving fencing, graded curtains, ? 15. Fly to snag aloft points on a large flying kite system.